Bridgeway advances client success by combining working capital loans with capacity building guidance. Decades of industrial decline took a major toll on New Kensington’s economic vitality. Helping to fuel renewal is Kafa Buna Coffee. 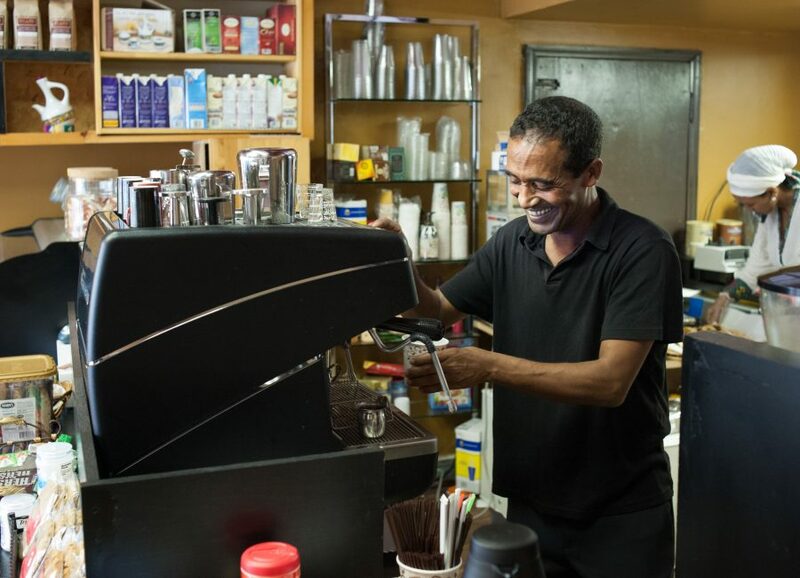 It opened in 2016 to bring Ethiopian coffee culture to the community. Bridgeway provided an Entrepreneur Loan for Kafa Buna Coffee to launch and connected them with expertise that positioned their business for success. Mengesha Abtew and Waganesh Zekele worked with a team of skilled marketing consultants through Bridgeway’s Business Education program. The team helped them develop a marketing plan and achieve a well-attended grand opening event. Bridgeway funds projects with impact and connects entrepreneurs with expertise to overcome obstacles and maximize opportunities.